The patient is a 78 year-old male with a 20 pack-year history. 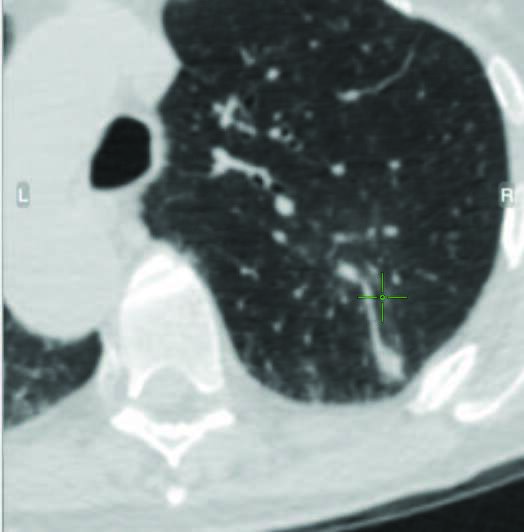 A visit to his PCP for a workup of an unrelated disease showed a right upper lobe mass off 3. 3cm. He was referred to thoracic surgery, and the decision was made to localize percutaneously and perform a wedge resection . 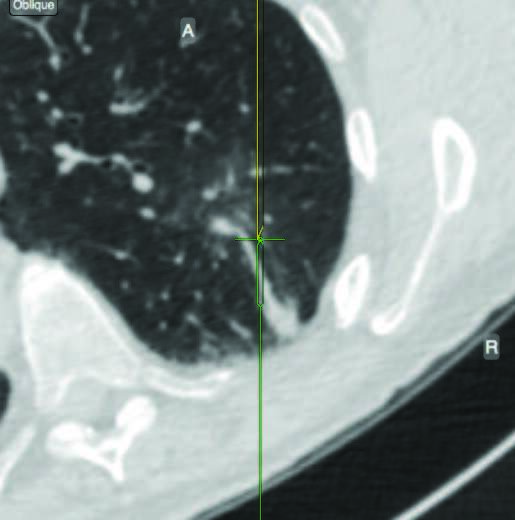 Upon review of the CT scan, it was identified how posterior this Methylene Blue injection would be. Based on the size and location of the lesion, it was determined that a longer 19ga Always-On Tip Tracked® needle was necessary to reach and localize for resection. The distance was 128mm from skin surface to target with 15mm of nodule motion. The planned path was made to be adjacent to the rib and avoid the fissures . The planning process took roughly 5 minutes. Prior to the injection, accuracy was verified by checking the main and secondary carinas . The target was confirmed and the procedure was converted to SPiN Perc™. Using a non- sterile needle to mark the entry point, the patient was prepped and draped for percutaneous localization. When respiration was matched, the needle was advanced to the target and 1ml of Methylene Blue was injected into the lesion. A trail of dye was left from the lesion to the chest wall to aid in identification for wedge resection. 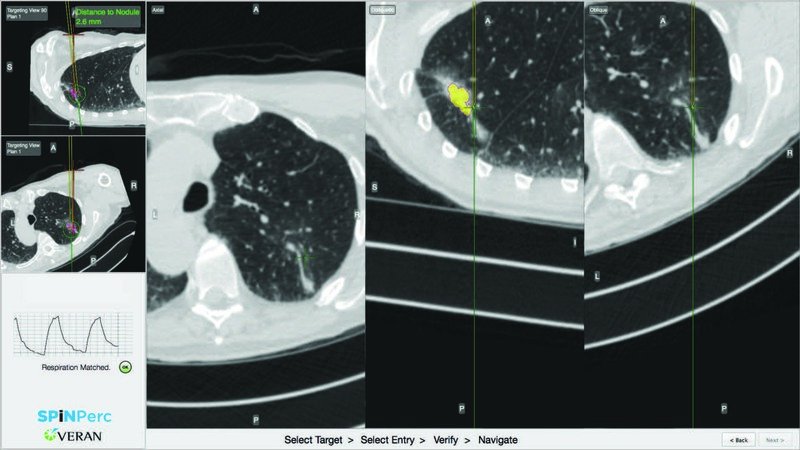 After the localization was complete, the patient was prepped for surgical resection. Navigation allowed for localization and resection to be completed in under 45 minutes. 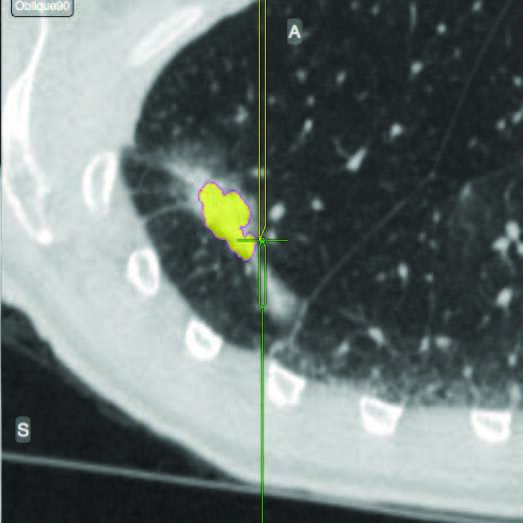 Final path revealed Lepidic Adenocarcinoma of the lung, so the patient underwent a complete RUL lobectomy.